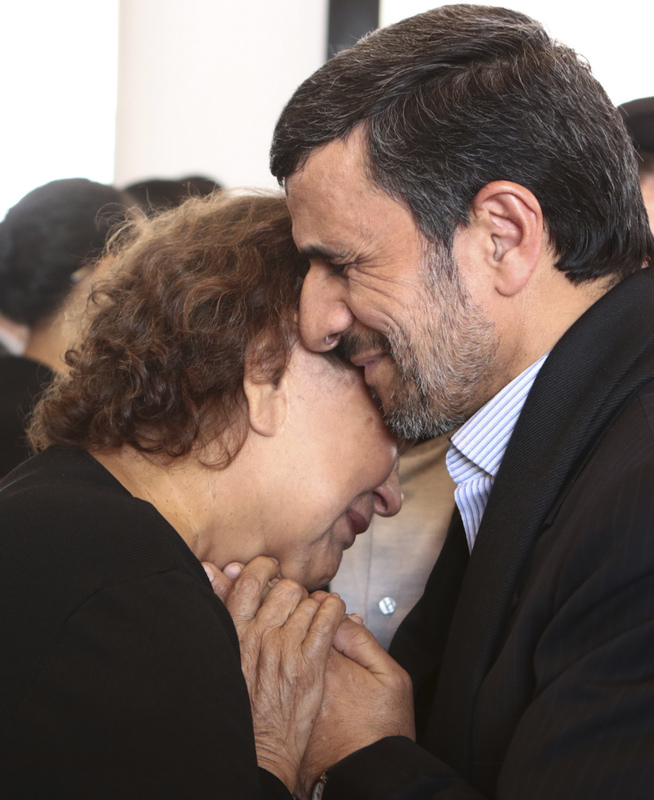 Ahmadinejad Touched And Consoled Chávez's Mother, To Clerics' Dismay : The Two-Way The Iranian leader attended Hugo Chávez's funeral in Venezuela. Afterward, a photo surfaced that Iran's conservative clerics say shows him sinning — by touching a woman to whom he's not related. Iran's President Mahmoud Ahmadinejad offered his condolences to Elena Frias, mother of Venezuela's late President Hugo Chávez, last week. This image was provided to news services by the Miraflores Palace — the office of the Venezuelan president. The New York Times adds that Iran's ruling clerics didn't see a leader showing his softer side. They saw "proof that the Islamic Republic's official representative had flouted that nation's absolute ban on physical contact between unrelated men and women." "Hojat al-Islam Hossein Ibrahimi, member of Society of Militant Clergy of Tehran, said that 'in relation to what is allowed (halal) and what is forbidden (haram) we know that no unrelated women can be touched unless she is drowning at sea or needs (medical) treatment.' He warned the Guardian Council, which vets potential candidates in Iran's elections, to investigate a candidate's religious understanding 'because someone who doesn't know religion will make what is allowed forbidden and what is forbidden allowed.' Some still question the Guardian Council's decision to approve the then unknown Ahmadinejad's candidacy for the president in 2005. "Conservative member of parliament Seyyed Mohammad Pourfatemi encouraged clerics and sources of emulation (marajeh) to 'confront seriously and condemn the president's latest actions and not allow him to do what as he pleases when it comes to infringing Islamic laws.' And Esfahan Friday prayer leader and Ahmadinejad critic, Hojat al-Islam Mohammad Taghi Rahbar, said that the actions of the president 'are far from the status of a Muslim.' "
"Iranian government spin doctors," the BBC says, "tried to deflect the criticism by claiming the photograph was faked." But a photo that later surfaced showing Ahmadinejad in an identical embrace with a man is the one that appears doctored, the BBC says. It looks like an image of Egypt's Mohamed ElBaradei was put in place of Chávez's mother. But ElBaradei, who is much taller than Ahmadinejad, "appears significantly shorter than the Iranian president" in the doctored image, the BBC says. Ahmadinejad was among the world leaders who attended Friday's funeral for Chávez in Caracas. Before traveling to Venezuela, he also got in trouble with Iran's clerics for writing that Chávez "will come back, and along with Christ the Saviour, the heir to all saintly and perfect men, and will bring peace, justice and perfection for all."